Over 2,000 members of Egypt's press syndicate gathered on Wednesday at the syndicate headquarters in Cairo for an emergency meeting to respond to the recent storming of the HQ by police, as security forces surrounded the building from all directions and regime supporters hurled insults at members attending the meeting. The syndicate issued a statement at the meeting outlining a set of demands on the government including the dismissal of interior minister Madgy Abdel-Ghaffar and the release of journalists jailed in cases related to freedom of expression, as well as instructions for news outlets on how to support these demands. Police forces and counter-protesters holding up images of the country’s president blocked the main street leading to the syndicate building, making it extremely difficult for journalists to gain access to the union's HQ from that direction. Journalists were forced to take another route to access the building and were required to show syndicate ID cards at three police checkpoints in the area. The police and counter-protesters gathered on both sides of the street where the syndicate is located, leaving the participating journalists 300 metres in which to convene. The scene witnessed intermittent protest chants, mostly against the police. 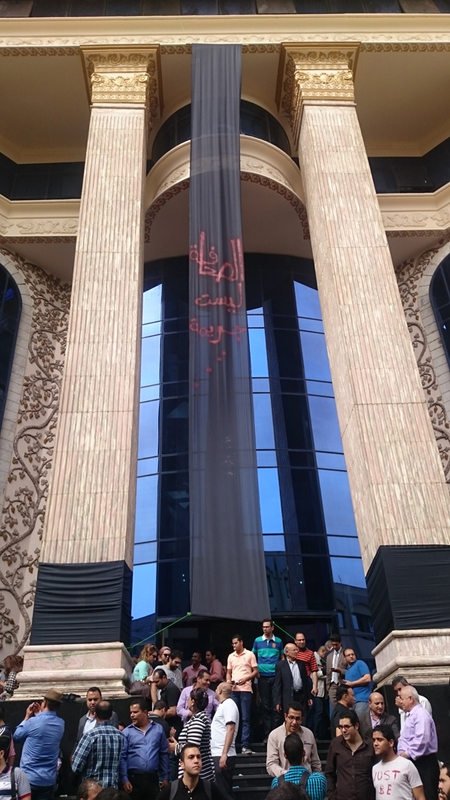 A vertical black banner was displayed at the front of the syndicate building with the words "journalism is not a crime," while participants held placards saying "I am a journalist, not a terrorist" and "freedom for the brave." 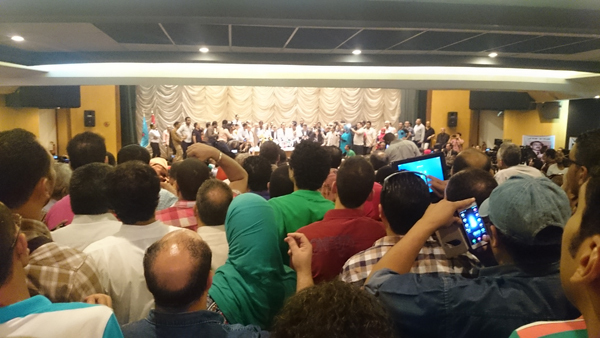 Vociferous chants such as "the interior [ministry] are thugs", "hold your head high, you are Egyptian" also resounded. While police mostly asked syndicate members for IDs as they headed towards the gathering, some of the counter-protesters, who arrived in buses and trucks and used loud speakers blasting music, harassed journalists at the scene. Near the end of the event, veteran Ahram journalist Khaled Dawoud was physically assaulted, according to eyewitnesses. Others were also reportedly attacked, though no major skirmishes have been reported. The past few days saw pro-regime protesters approach the syndicate headquarters and occasionally throw rocks at journalists holding a sit-in at the HQ since Sunday night. Dozens of lawyers also gathered at their syndicate building adjacent to the press syndicate headquarters, as Lawyers Syndicate declared its full support for the journalists. Last June, the Lawyers Syndicate held a strike itself to protest an assault on one of its members, who was badly beaten by police. Tensions between journalists and the police reached their highest level after security forces stormed the press syndicate building on Sunday and arrested two journalists, Amr Badr and Mahmoud El-Sakka, who were staging a sit-in, a move described by syndicate head Yehia Qallash and many journalists as an "unprecedented assault." The prosecution said that "the arrest warrant and the procedures being conducted by the Ministry of Interior are correct and the two suspects are facing criminal charges that are not related to their work," explaining that there are no legal or constitutional conditions that prevent police from arresting journalists from inside the syndicate headquarters. "If investigations reveal that both journalists agreed with the syndicate chairman to hide in the syndicate, this will be considered a violation of the law and a crime committed by the chairman himself," the prosecution statement read. An arrest warrant was issued for Badr, chief editor and founder of the Yanair (January) news portal, and journalist El-Sakka, who works for the same website, shortly after they voiced their objection to Egypt's recently-announced Red Sea island deal with Saudi Arabia. The deal, which acknowledges Saudi sovereignty over the islands of Tiran and Sanafir, has stirred major controversy in Egypt, though it is yet to be approved by parliament. Badr and El-Sakka, who are detained pending investigation, were among dozens of activists and journalists who were ordered arrested a few days before the 25 April protests against the island agreement. According to the press syndicate, 46 journalists were arrested while covering the protests, with most being released after a few hours. 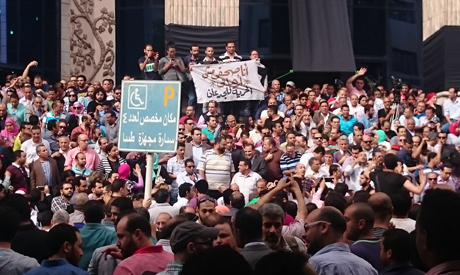 The Sunday storming of the press syndicate prompted union leaders to call on members to attend an emergency general assembly meeting today. Karem Mahmoud, the syndicate deputy, told Ahram Online that "the journalists’ demand [that the interior minister be sacked are] clear, and they will not give up on it." He added that "it is hard to understand why the government insists stubbornly on not correcting its mistake." The press syndicate gave the government one week to meet its demands, saying further measures would be adopted should the demands be ignored. The syndicate has more than 8,000 registered journalists who work for state-owned and private news outlets. Wednesday's gathering, attended by chief editors from the country’s major news outlets, was the largest of its kind since a 1995 rally against a law restricting publishing under former president Hosni Mubarak. On Tuesday, which marked World Press Freedom Day, journalists also protested on the stairs of syndicate building, though others attempting to participate were denied entry by police, who barred non-syndicate member from entering. Among those prevented from entering were Mona Mina, board member of the Doctors Syndicate, and members of the Egyptian Social Democratic Party. The Doctors Syndicate held a general assembly meeting in February in response to an attack the previous month where policemen reportedly assaulted two doctors at Cairo's Matariya Hospital after one of the physicians refused to fake a medical report for one of their colleagues. The press syndicate said on Tuesday there are 29 Egyptian journalists in jail, either sentenced to prison or facing trial. "Unfortunately, the Committee to Protect Journalists has listed Egypt as second after China in the number of jailed journalists," the syndicate said in a Tuesday statement. "Security forces stormed the premises of many news outlets [in recent days] and 14 gag orders on publishing have been imposed in different cases." The most recent gag order on publishing issued by Egypt's top prosecutor came in the case of this week's storming of the Journalists Syndicate premises, an order the union says it intends to challenge in courts. The syndicate also called on all papers and news outlets to display a logo that reads "no for gag...no for silencing" on their front pages. Judging by reports in The Independent, All Ashram is doing double reporting. There is on account in English that follows the coverage in most newspapers while the Arabic version notes the failure of the protests, says few attended, etc, This is journalism? Egyptian media is highly unprofessional and needs massive reforms. A strong country has a strong media as a propaganda device to communicate its point of view. This is a soft power that Egypt once had and has lost due to the decline in media quality and being unable to keep up with changes. Rather than having a set of demands, the Egyptian media should look into themselves and compare their media output with that of USA, Russia, Europe, Saudi Arabia and even Qatar (which has a population that is less than 1% of Egypt yet is able to dedicate a channel for propagandizing its view of Egypt). The media has failed to communicate Egypt's achievements in the last 2 years and has instead been a stage for naive talk shows that repel the viewer. Wake up, you are already decades late. Democratic countries generally have spokesmen for important institutions. These people present the official view and answer questions from journalists. Most presidents hold newsconferences where they answer questions, many critical. The job of a journalist is to gather facts even if facts challenge those in power.